... und für alle, die sich für handgemachte Röschen interessieren. Die Rosen der letzten Karte hab ich nach dieser Anleitung gemacht. Es geht mit SU oder anderen Handstanzen, aber auch mit Spellbinders. Ich habe mein Quilling- Tool benutzt, es geht aber auch ohne. Wer experimentieren möchte: Hier gibts noch weitere Anleitungen. Noch ein Tipp zu den normalen Kreisröschen: Ich beginne aussen mit dem aufrollen, n i c h t innen (so gehts einfacher). Very pretty and quite elegant! Thanks for sharing with us at 613 Avenue Create! Thanks for playing along with our Pastel and Polka Dot April Challenge! this is just as lovely as can be!!! 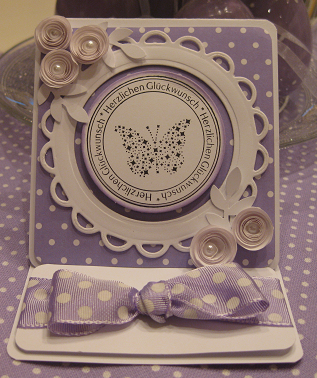 Pretty lavender, pretty polka dots and pretty layout! wieder eine wunderschöne Karte,einfach super geworden. This is beautiful! I love how you cut the circle center out of the scalloped die! Great idea! Love the hand made flowers and purple too. Thanks for playing in our neighborhood at 613 Avenue Create! Such a lovely easel card. Thanks for playing with my Amusing Challenge this week...I'm really glad you did! A beautiful easel card. Your ribbon is just perfect with your background too. 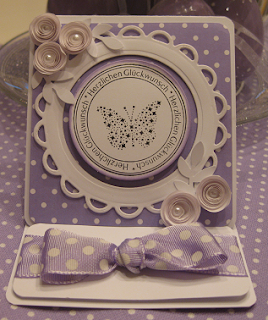 What a cute card...Love the purples! Thanks for joining us at our neighborhood---613 Avenue Create. Have a blessed day!